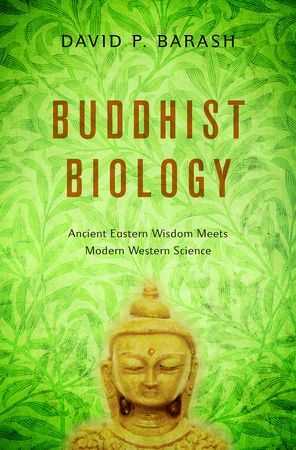 “Buddhist Biology: Ancient Eastern Wisdom Meets Modern Western Science” was published in December 2013 by Oxford University Press. 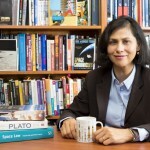 A: For better or worse, there has been a lot of intellectual conflict between science and religion these days, and although I consider myself one of the “New Atheists,” I am also an aspiring Buddhist and have been about as long as I’ve been a biologist: more than 40 years. The sad truth is that for the most part, science and religion do not get along very well – especially because religion keeps making various “truth claims” that are simply untrue! But Buddhism is a fascinating exception. 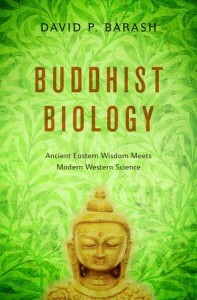 In my book, I discuss Buddhism as a philosophy and perspective on life, without the abracadabra, and show how it has a number of fascinating convergences with biology, especially ecology, evolution, genetics and development. Q: In a blurb for the book, Richard Dawkins – an evolutionary biologist and renowned atheist – wrote “Buddhism is surely religion’s best shot” in terms of attempts to reconcile science and religion. What are some examples? A: In the book, I relate Buddhist concepts to science. Anatman (“not-self”), for example, means that no one has an internal self that is distinct and separate from the rest of the world. Similarly in ecology, organisms and environments are inextricably inter-connected. Also, Anitya (“impermanence”) refers to the fact that all things are temporary and eventually return to the non-living world. Anitya has parallels with evolution, in that not only is every individual organism’s time on earth temporary but also organisms ebb and flow across time. Q: Most people in the West think of karma as a sort of Golden Rule, in that how you behave affects how you will be treated. 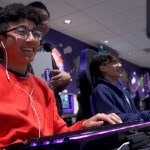 How do you connect karma with science? A: The Dalai Lama has defined karma as “the simple law of cause and effect,” such that whatever we, our ancestors and our descendants do all have consequences. Moreover, in a deep evolutionary sense, every living thing – including ourselves – is a karmic result of what our ancestors did in the past. This is key to natural selection: the differential survival of competing genes, which literally give rise – at least in part – to who and what we are. A: I don’t accept some of the more extreme notions of Buddhism, especially karma as it pertains to reincarnation. That is, I don’t believe that that each of us is going to be reborn in the future as some creature or other, or that our current situation is somehow a result of what we did in a prior life. By any biological or scientific standard, this is arrant nonsense. But biologists including myself acknowledge that every organism is literally composed of atoms and molecules that have been and will continue to be recycled from a “prior existence” as plants, other animals, dirt, rocks, atmospheric particles, etc. Q. Science and religion are ways to understand our world and perhaps get at the age-old question, “What is the meaning of life?” So, what is your take on the meaning of life? A: Both Buddhism and biology (and also existentialism) teach that there is no inherent meaning to life. We simply are, and that “we” or “I” or “you” or “he” or “she” is merely a temporary aggregation of matter and energy, destined (or doomed) to collapse back into the stuff of the world. Therefore, if we want to make our lives meaningful, we should not look to some outside deity, but rather to our own actions. In the final chapter, I develop what I call “existential biobuddhism,” which adds existentialism to the convergence of biology and Buddhism, emphasizing that there is no such thing as “the meaning of life” outside of how we mindfully decide to live.